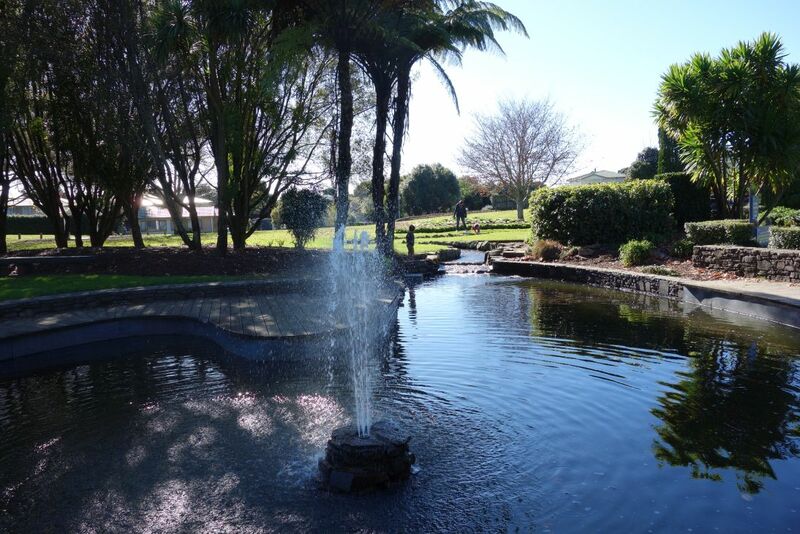 Yatton Park, in Parkvale, Tauranga, was established by John Alfred Chadwick in the 1860s after having bought land confiscated in the wars between Maori and the British. 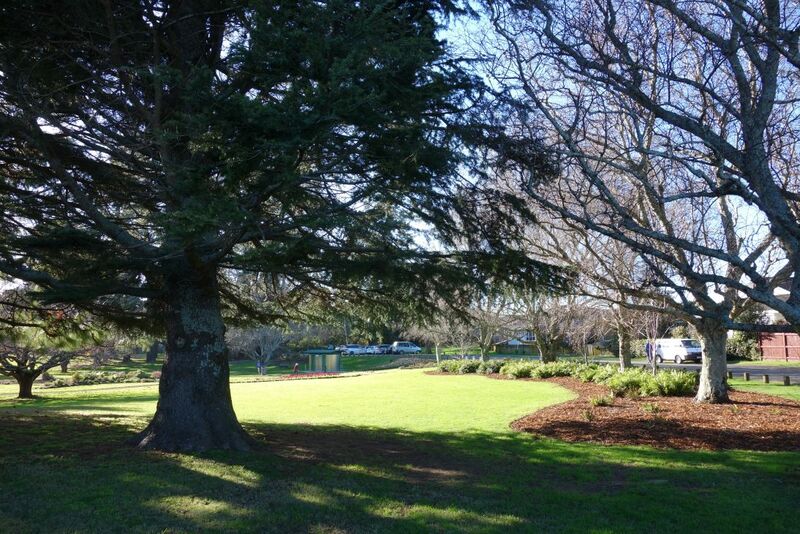 He named the location Yatton Estate, and planted many of the trees still standing in the park. 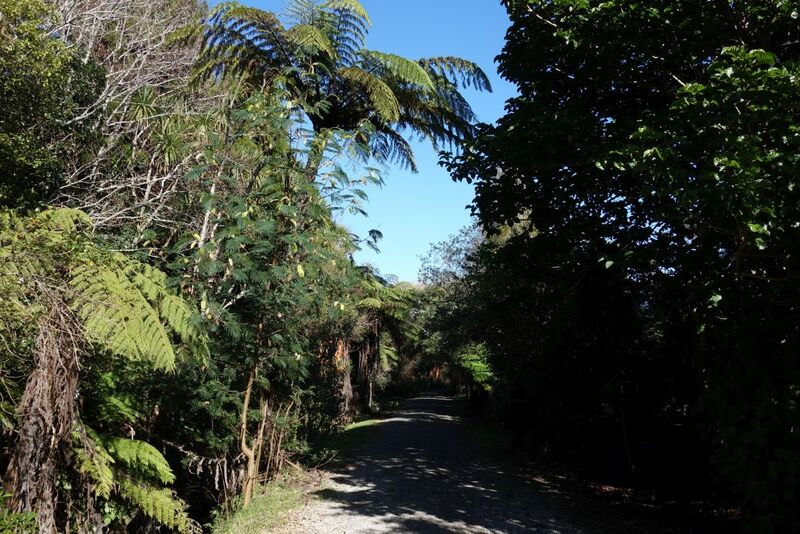 Also known as Tutarawananga it is the location of the first school in New Zealand, established in the 14th century to train tohunga (carriers of knowledge, priests or wise men). 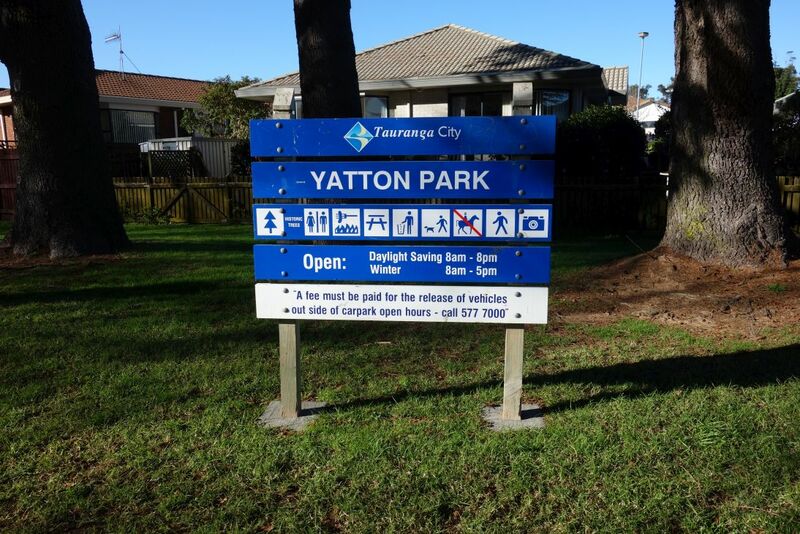 Yatton Park is accessible directly from Fraser Street, and near the entrance there are parking areas and toilets. 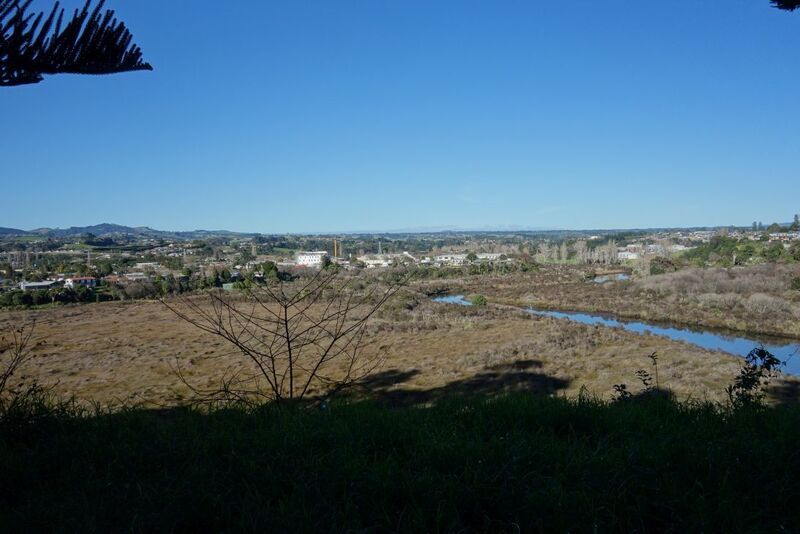 From Yatton Park a track leads down to the Waimapu Estuary, and along the estuary to Fraser Street by the Fraser Street Reserve. A side track leads up to Esk Street and continues on to Fraser Street by number 330. 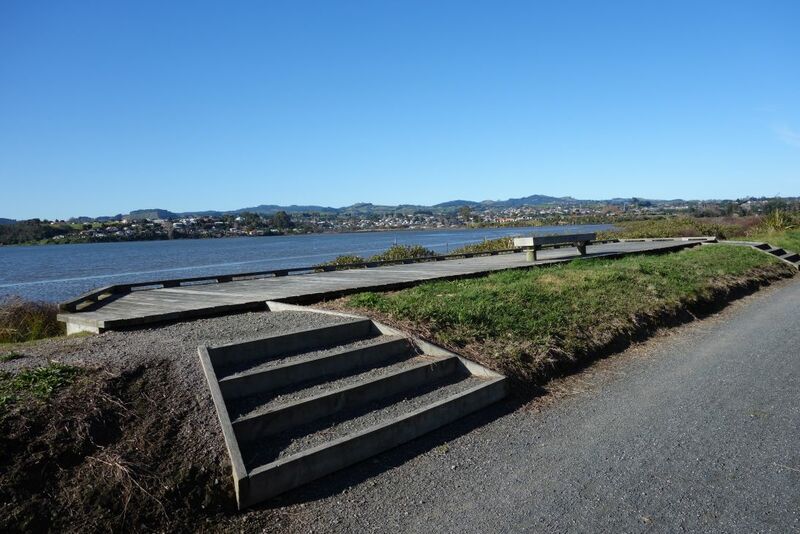 Tauranga City Council publishes a small brochure with varioius walks around the city. It can be downloaded directly from the council web site. 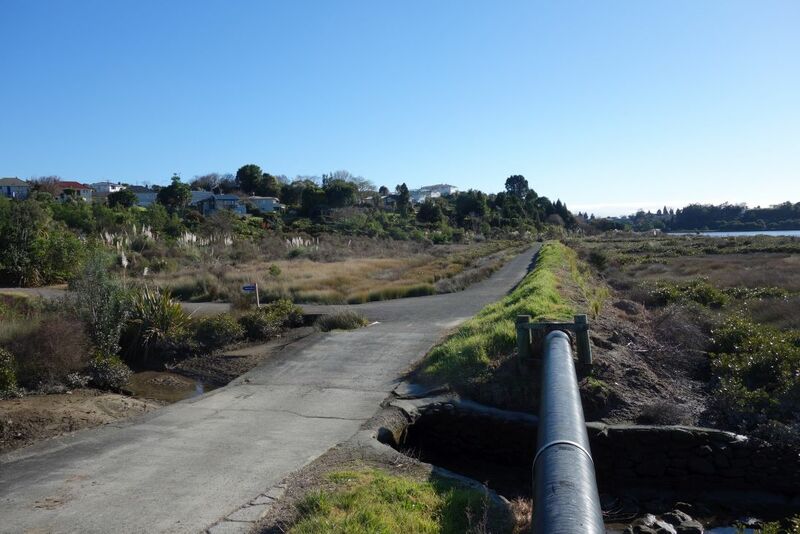 The walk described here is part of the Waimapu Estuary walk described in the brochure. The entrance to Yatton Park from Fraser Street. The park is closed to vehicles at times dependent on the time of year. 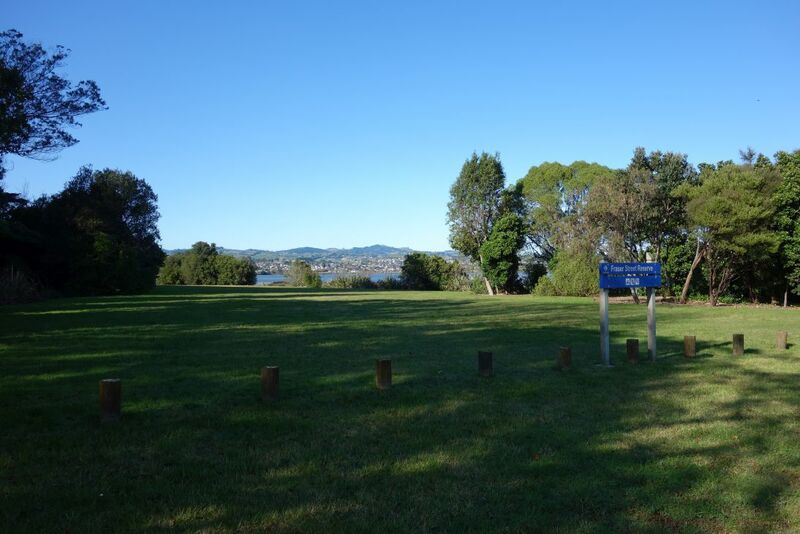 Dogs are allowed in the park, and there are picnic and barbecue facilities available. 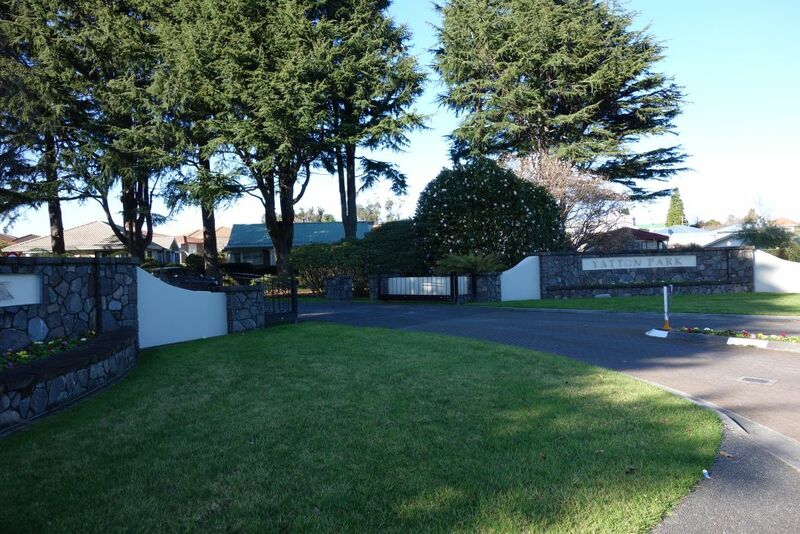 The parking areas are near the park entrance. 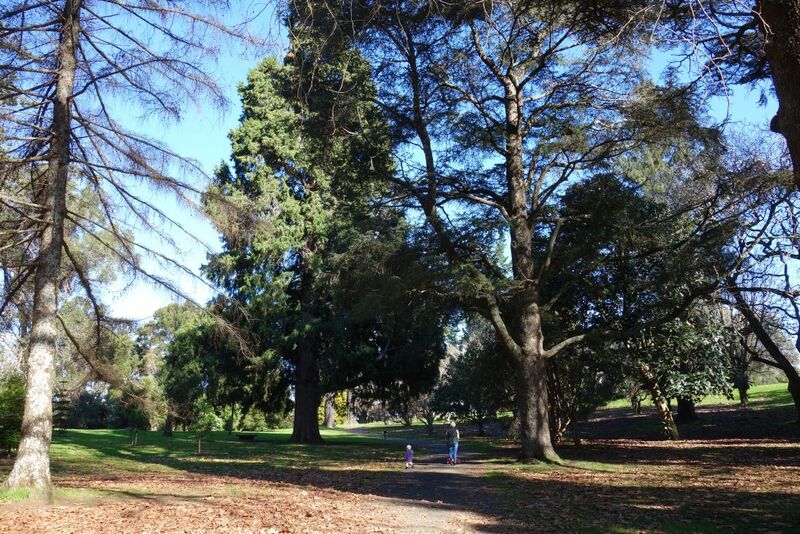 Some of the trees were planted in the 1860s, making them about 150 years old. 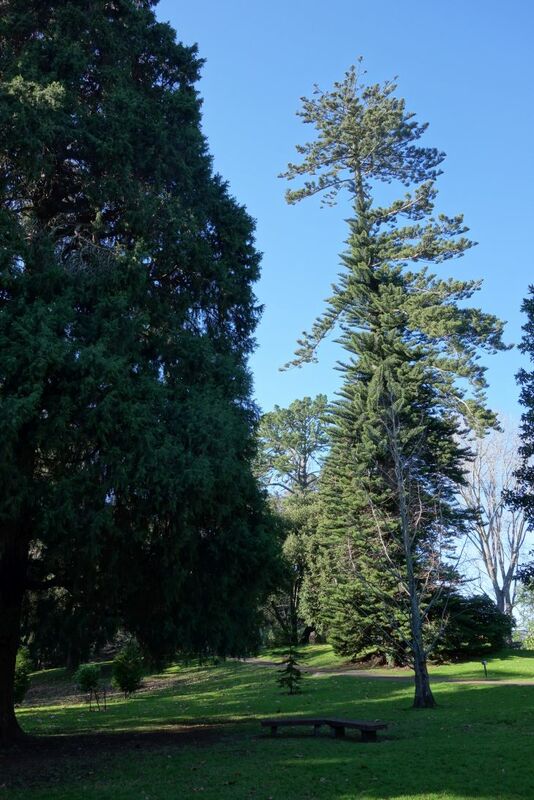 The park has a Norfolk Island Pine, supposedly the tallest in New Zealand, and the tallest tree in Tauranga. However, it looks as if the top has broken off at some time, so the posted height of 51 metres may no longer be correct. 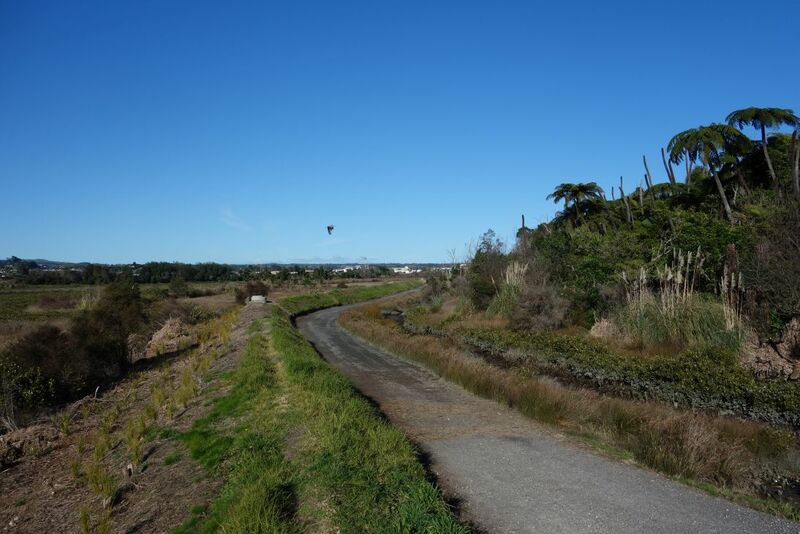 Looking from the park near the start of the loop track and the track to the Waimapu Estuary. 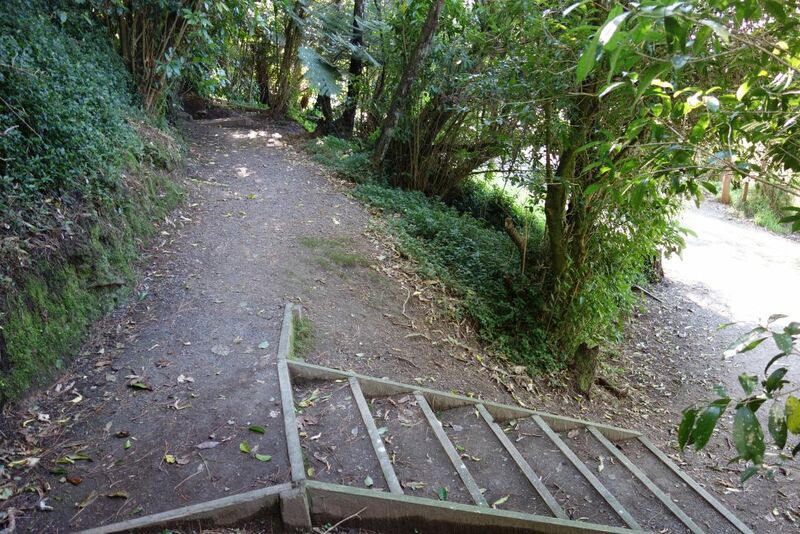 Steps lead down from the park to the Waimapu Estuary with a short loop track, and a track leading to Fraser Street Reserve. 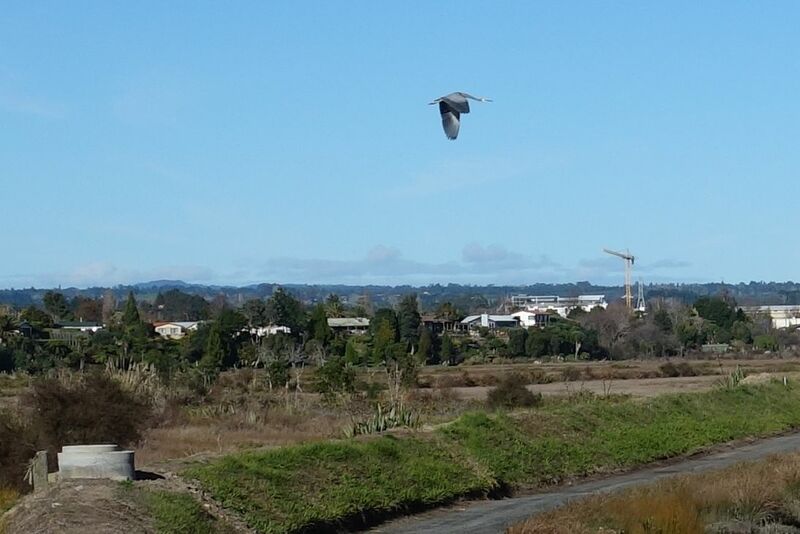 Looking back along the estuary track, with a heron caught in flight. Numerous wading and other birds can be seen along the track. A full-size crop showing the heron in flight. The track branching off to the left leads up to Esk Street, and to Fraser Street between Esk Street and Hampton Terrace. 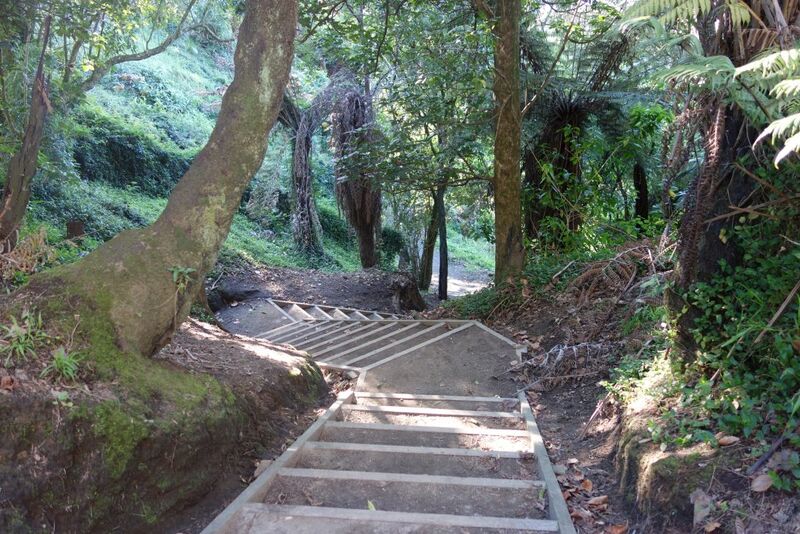 A lookout and rest area by the Waimapu Estuary track. 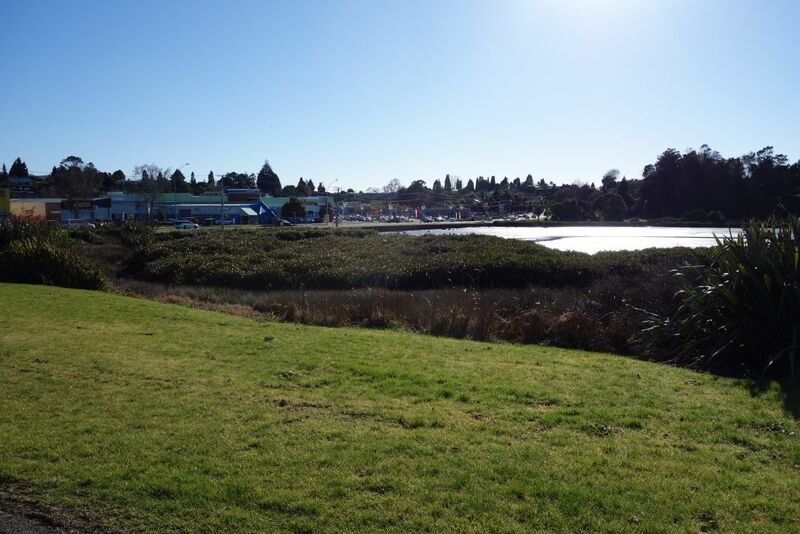 Approaching Fraser Street by the Fraser Street Reserve and the Fraser Cove shopping centre. 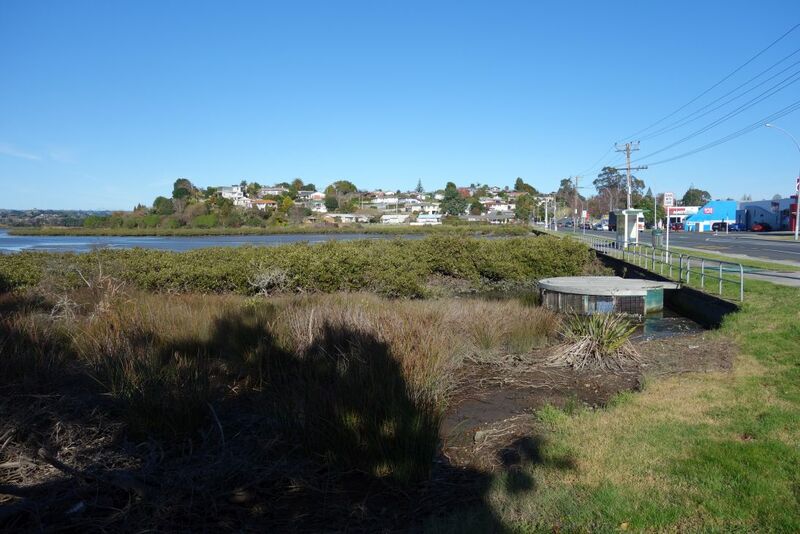 Apparently the grass areas on both sides of the Fraser Street estuary bridge are known as Fraser Street Reserve. Here looking back towards Yatton Park. 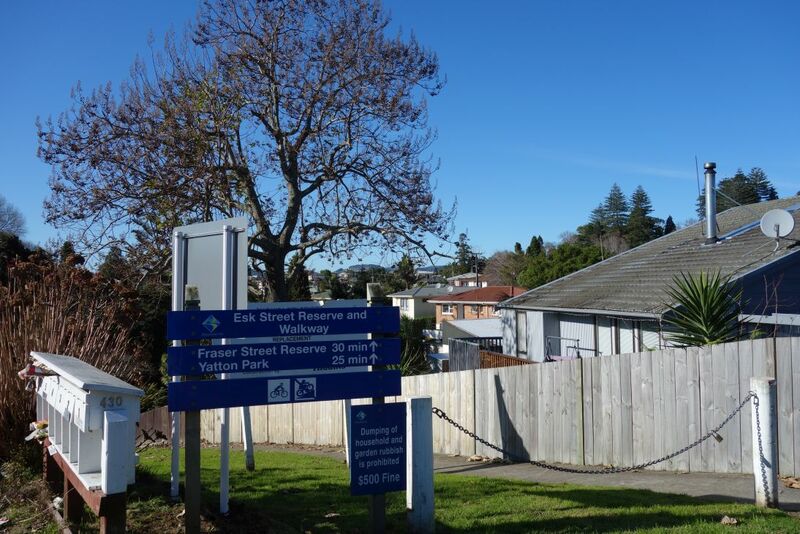 The Fraser Street Reserve after crossing over the Fraser Street bridge. Looking back towards the reserve and track leading to Yatton Park on the other side of the estuary. On the side track leading to Esk Street and Fraser Street a flowering wattle (acacia) tree on the left attracts both bees and monarch butterflies. 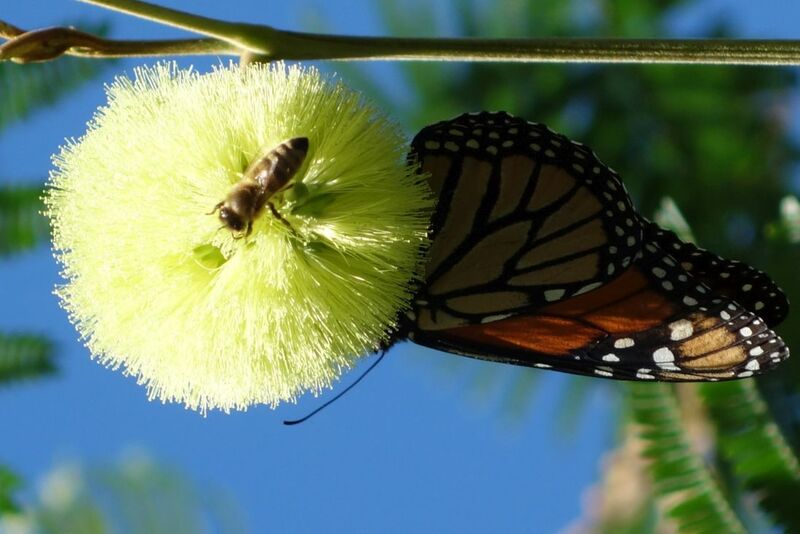 Normally the monarch butterflies would be hibernating at this time of year, but on this sunny winter’s day there were numerous butterflies around the tree, and in other places in Yatton Park. The track entrance next to 330 Fraser Street. 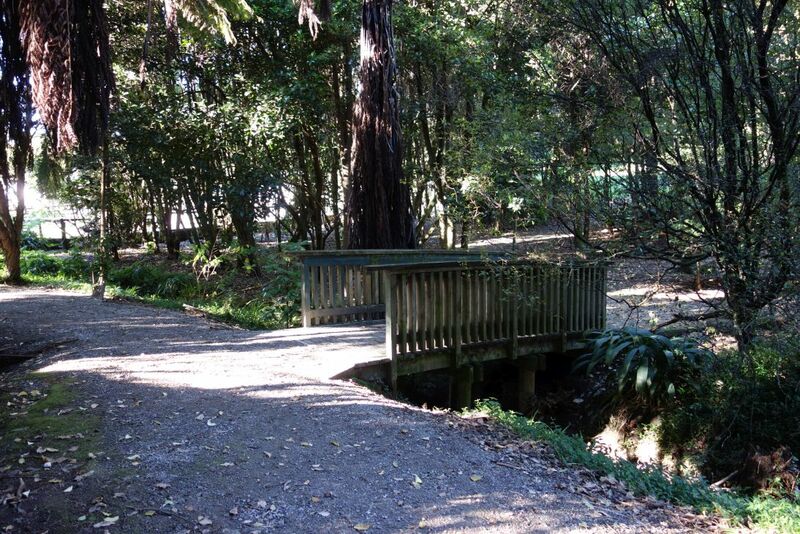 A small bridge leads off to a track leading to Esk Street. 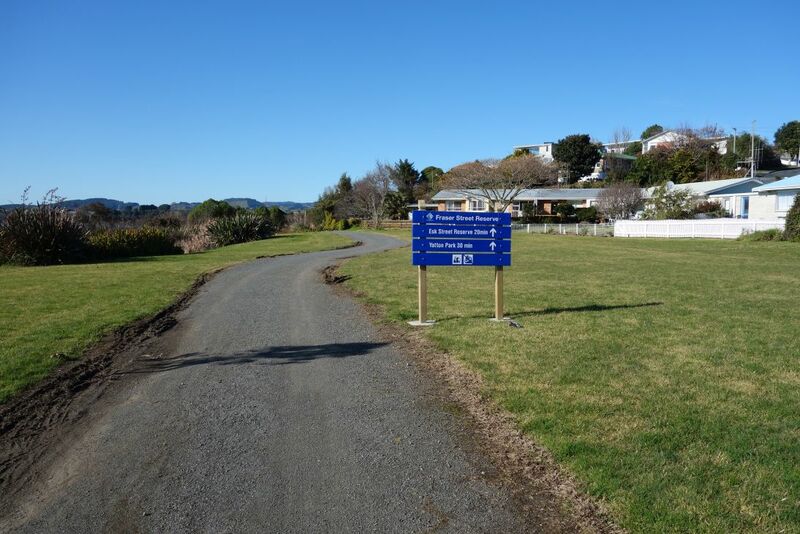 Part of the track to Esk Street is not formed, but runs through a grass area to the street. 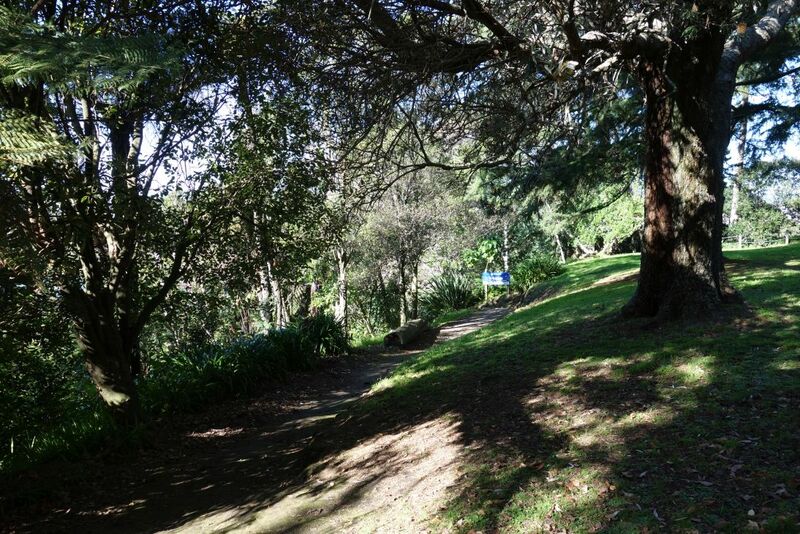 Here looking down the track from Esk Street. On the return walk the loop track from Yatton Park is completed. The track entrance at the top of the loop track. 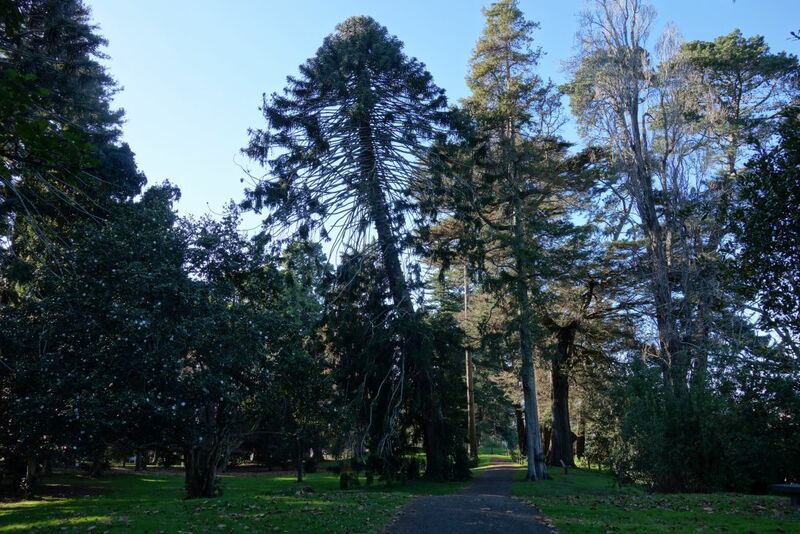 Yatton Park is a popular destination for dog owners and for walking with children, with easy and well-formed tracks through the park. 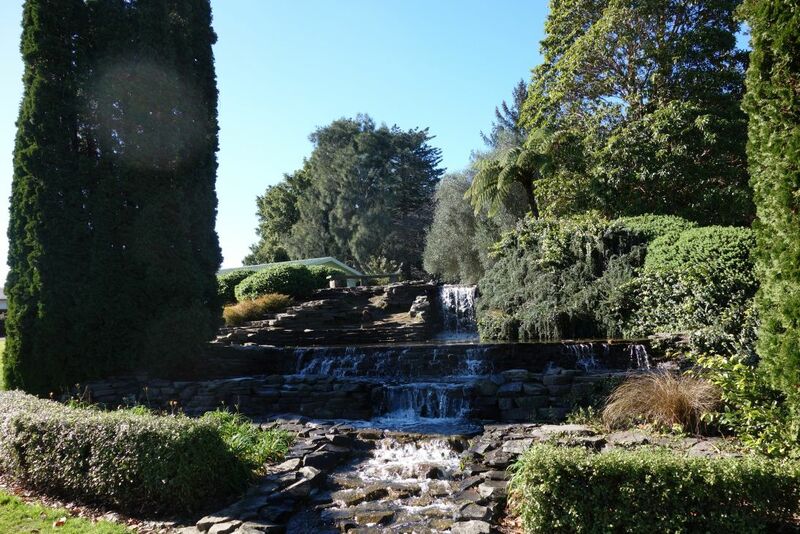 A set of small waterfalls in Yatton Park. From the waterfalls the stream continues on to a small lake with a fountain. 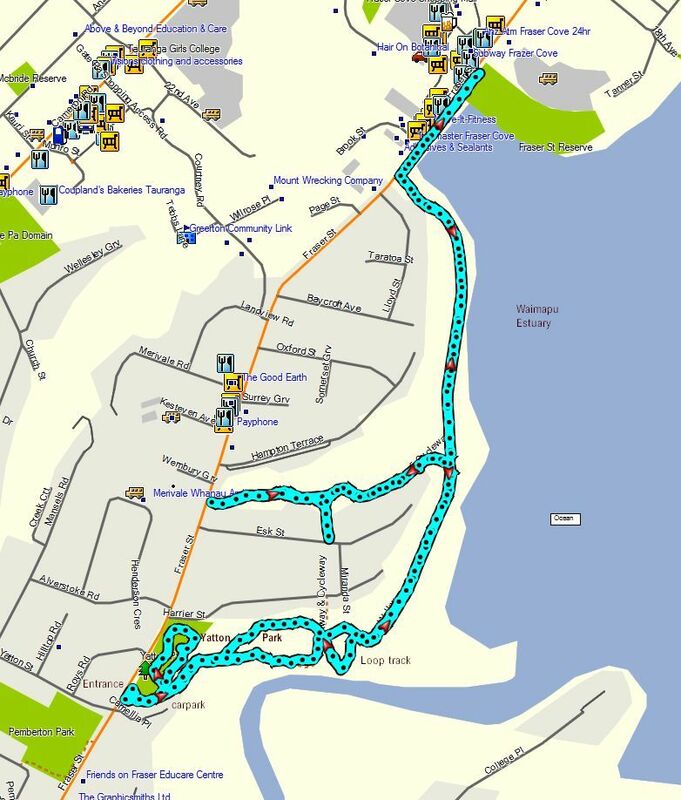 The GPS tracklog shows the tracks walked, with some of the places of interest marked. Total distance walked was about 6.5 km. Walking mostly at a slow pace it took about 1 hour 45 minutes. 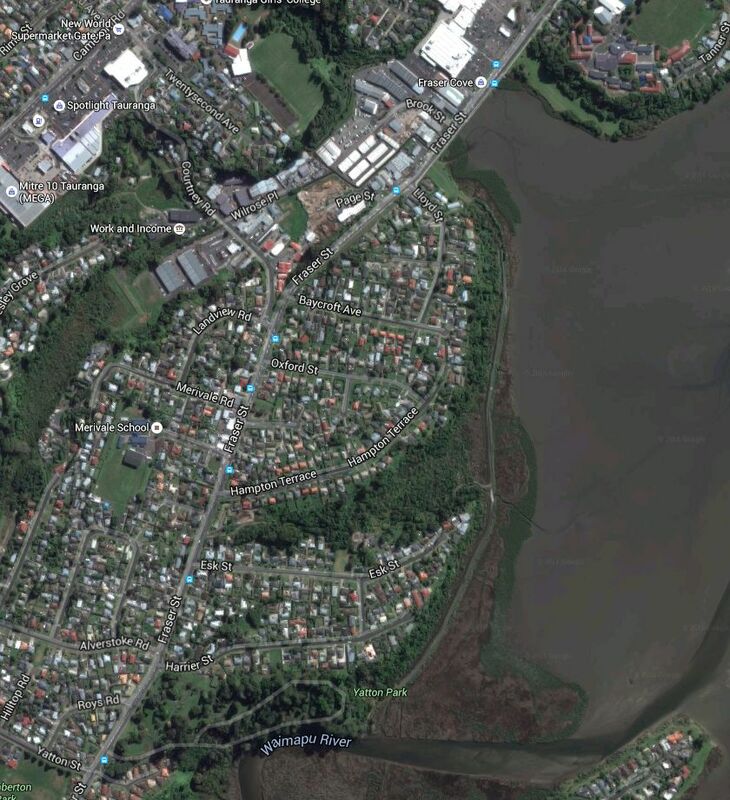 The satellite image, courtesy of Google Maps, shows the same area. The tracks were walked on July 12, 2016. 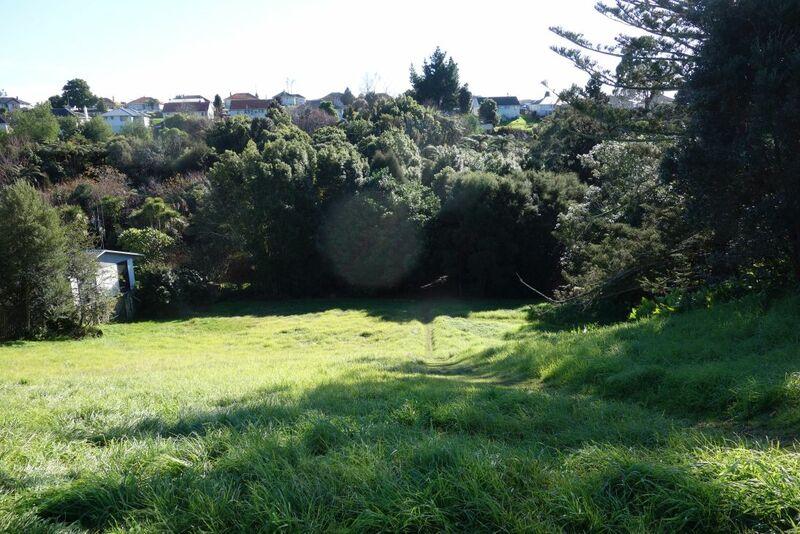 This entry was posted in Walks and tagged Fraser Street Reserve, Tauranga, Tutarawananga, Waimapu Estuary, Yatton Park on 2016-07-12 by nzartig.